Primary Natural Resources coal, tungsten, lead, hydropower potential. AN ECONOMIC GIANT of East Asia, South Korea’s economy took off after the Korean War of the 1950s. South Koreans now enjoy a per capita income 20 times that of the North but desires for reunification remain strong. Relations began only in 2000, but South Koreans worry about the vast sums of capital that would be required to bring their northern cousins up to similar living standards. 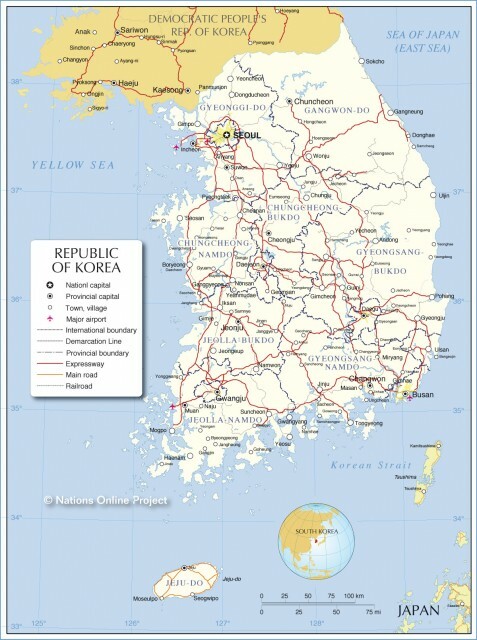 Like its neighbor to the north, North KOREA, most of South Korea (Republic of Korea) is mountainous, with higher peaks concentrated in the Taebaek Range, the “backbone,” running along the eastern coast of the peninsula. The western coast is far more level, with numerous inlets and thousands of islands—South Korea’s overall coastline is more than 1,488 mi (2,400 km), mostly because of these features. South Korea shares a border of 151 mi (248 km) with North Korea, and lies across the Korea Strait from Japan, and the Yellow Sea from CHINA. The climate is said to be one of the healthiest in the world, temperate most of the year, with the southernmost regions (notably the island of Cheju) lying within the subtropical zone, influenced by the warm Japan Current from the south. The southeast also has resorts and hot springs near Pusan. While the south has more agricultural resources than the north, it lacks the north’s mineral resources and must import most of the raw materials needed in its factories. The central-west regions are the most fertile, growing rice, root crops, and fruit. Ginseng has been one of the country’s signature crops for centuries, centered on the town of Komsan, where richly mulched soil is carefully shaded by thatch or fiber mats, then left to fallow for 10 to 15 years before another planting. Most rivers are relatively short but navigable, like the Han (Han-gang), which flows through Seoul to its port city, Inchon, 24 mi (40 km) away. The many islands that lie off the west and southwest coast of Korea are mostly of volcanic origin and are noted for their beauty, coral beds, diverse marine life, sponges, and pearls. The largest, Cheju, 62 mi (100 km) south of the mainland, is mostly mountainous and famous for its mother-of-pearl. Its largest peak, Halla (6,435 ft or 1,950 m), looks white from a distance because of the large outcroppings of rock. South Korea has six cities with populations over 1 million (and containing over half the total population): Pusan, Taegu, Taejon, Kwangju, and the conurbation of Seoul and Inchon, with a total of 13 million people. Seoul means “capital” and has been the center of various Korean kingdoms for centuries. The Koreans originally migrated from Manchuria and set up several small principalities, which were gradually united into one state by the end of the 7th century. These earlier tribal groupings were called the Han, from which the preferred modern name for the state is derived: Han’guk, or Tae-han. The Kingdom of Koryo emerged in the 10th century, providing the country’s modern name, but it was transformed in the 14th century and renamed Joseon (or Choson, the name still preferred by North Korea). Influenced by Chinese politics and religion, Korea in turn influenced Japanese society, notably through the introduction of Buddhism. A golden age of Korean history followed, during which the Koreans invented the world’s first movable metal type, developed a world-famous silk industry, and invented a new (non-Chinese) alphabet. Weakened by internal factions, Christian ideologies from Western missionaries, and government corruption, the kingdom closed its ports to all foreigners but the Chinese in 1864, until its ports were forced open by the Japanese, who gradually extended their influence over the peninsula from protectorate (1905) to outright annexation in 1910. Brutal imperialist rule by the Japanese over the succeeding decades remains a source of great resentment among Koreans. Liberated from Japanese rule by the UNITED STATES and the Soviet Union in 1945, the two powers’ rival occupation led to the Korean War of 1950–53, and the partition of the country into North and South. The DMZ (demilitarized zone) dividing the two countries lies only 25 mi (40 km) north of Seoul, and the city grew significantly in the 1950s from the nearly 1 million refugees who fled the North. Land reform, education and economic expansion following the war has transformed the country from a poor agrarian society to one of the world’s most industrialized. Light industry changed over to heavy industry in the 1970s (steel, iron, chemicals), then to high-tech industries such as automobiles, ships, and electronics. Giant corporate conglomerates (known as chaebols, “fortune clusters”) are now known all over the world—Hyundai, Daewoo, and Samsung—and have become global in outlook (Daewoo Motors, for example, has factories in POLAND, UZBEKISTAN, and INDIA). In 1996, the top four chaebols accounted for 80 percent of the GDP and 60 percent of the exports. Despite this prosperity, Koreans face increased population problems, especially with urban crowding and severe housing shortages. The government is encouraging the development of new centers of technological research and industry, notably in the cities of the south, especially Pusan, the country’s second largest city, and the country’s premier harbor.